You have probably decorated every room in your house beautifully, but did you forget about the kitchen? 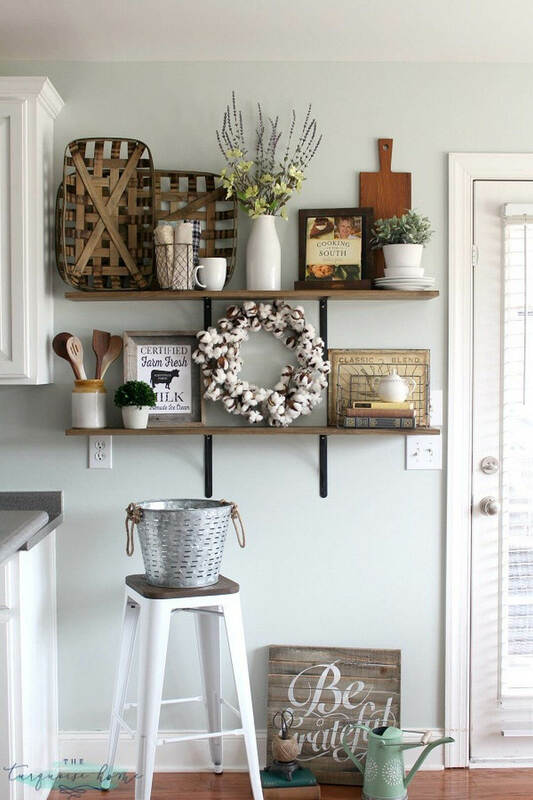 This post has 36 fun kitchen wall decor ideas that will make the space more than just a place to whip up a meal. 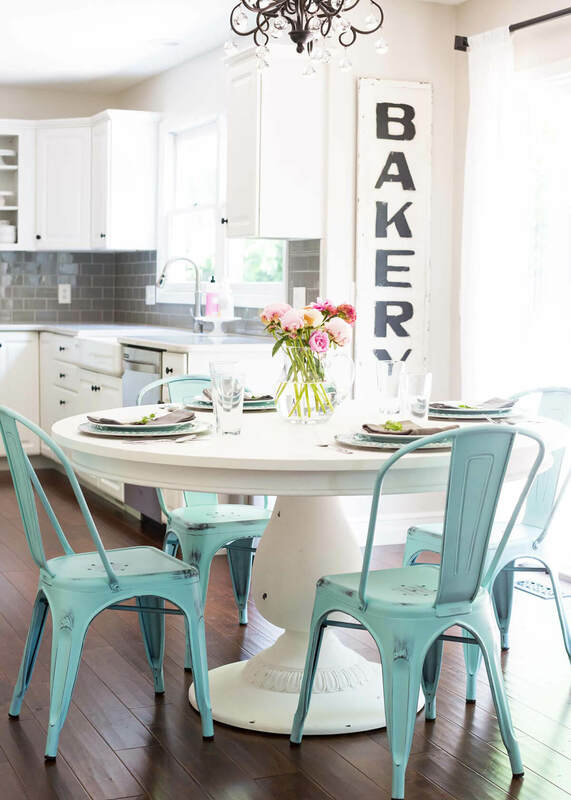 Whether your style is vintage, shabby chic, bright and colorful, or modern, these ideas will help give your kitchen a pop of personality! Gotta have that morning joe? Check out our space-saving solutions for a coffee bar. Honor a loved one by framing one of their famous recipes with our recipe card projects. 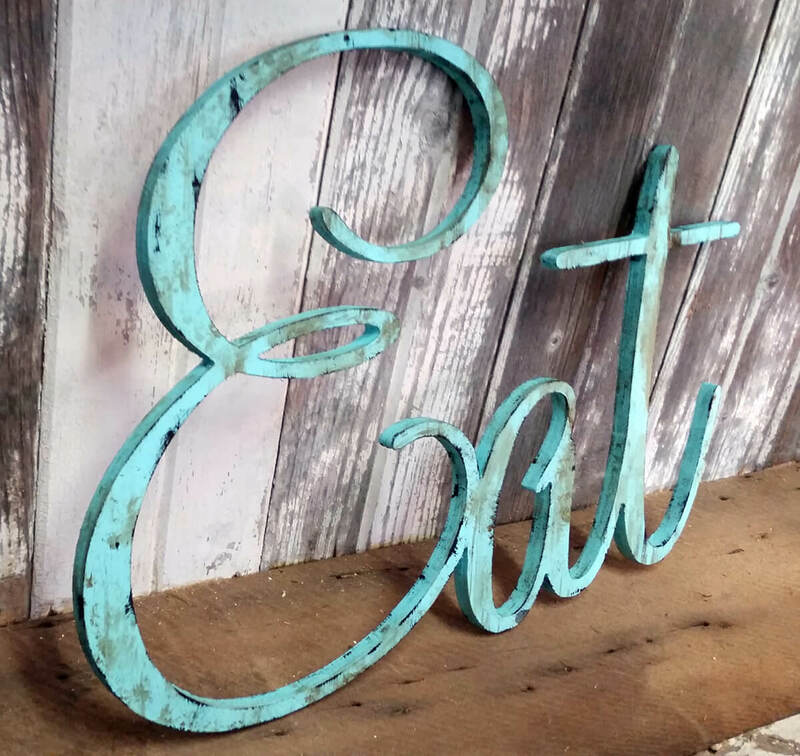 Set the mood for food with a unique wall sign like our “eat,” “bakery,” and “kitchen” art ideas. 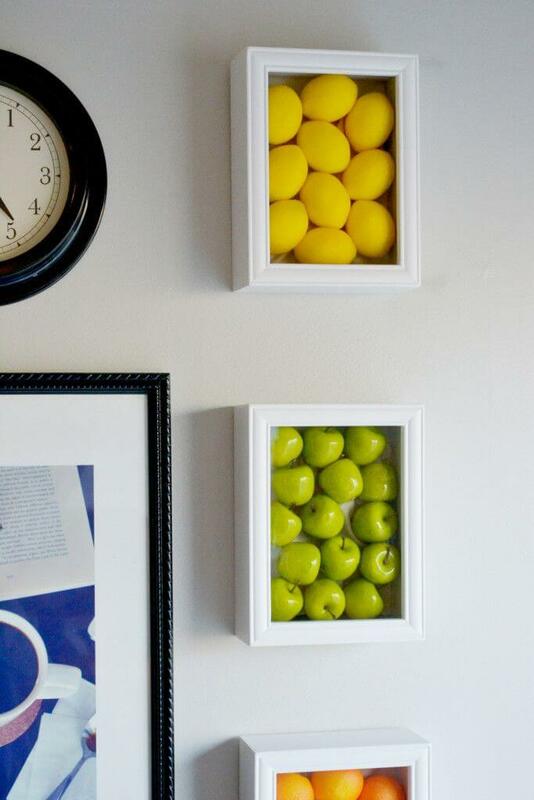 This list also has lots of kitchen wall decor ideas that double as space-savers. 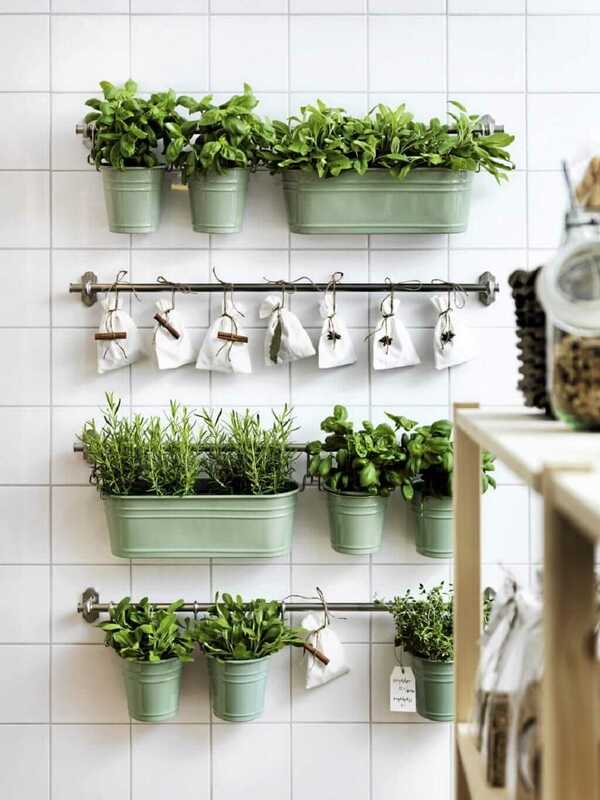 If your kitchen is small but mighty, check out the hanging herb garden and produce basket projects! Tired of hearing the dreaded “what’s for dinner?” question from your family? 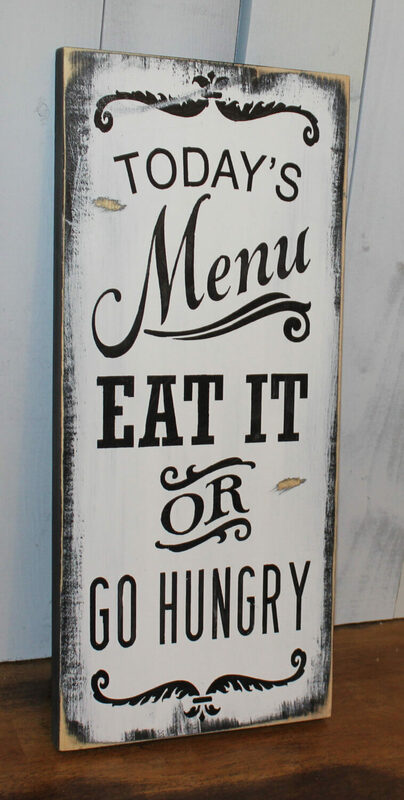 Try one of our fun and functional wall menu DIYs. 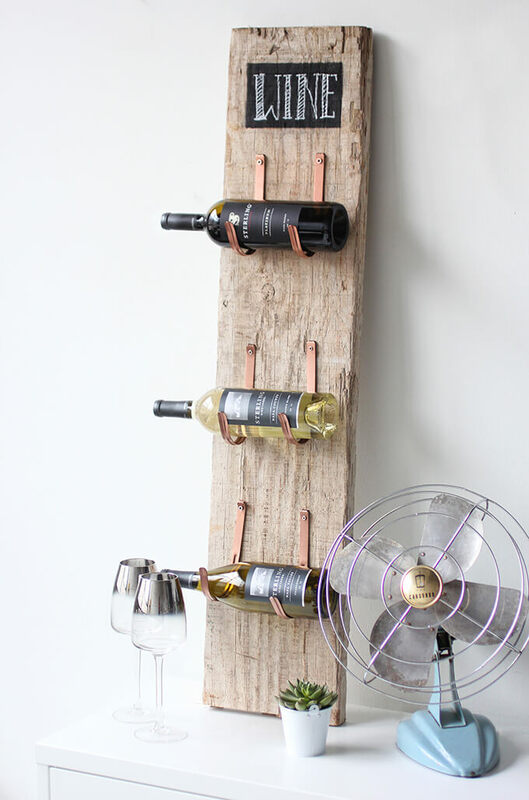 Store your favorite bottles of wine in style with one of our easy to make wine rack projects. 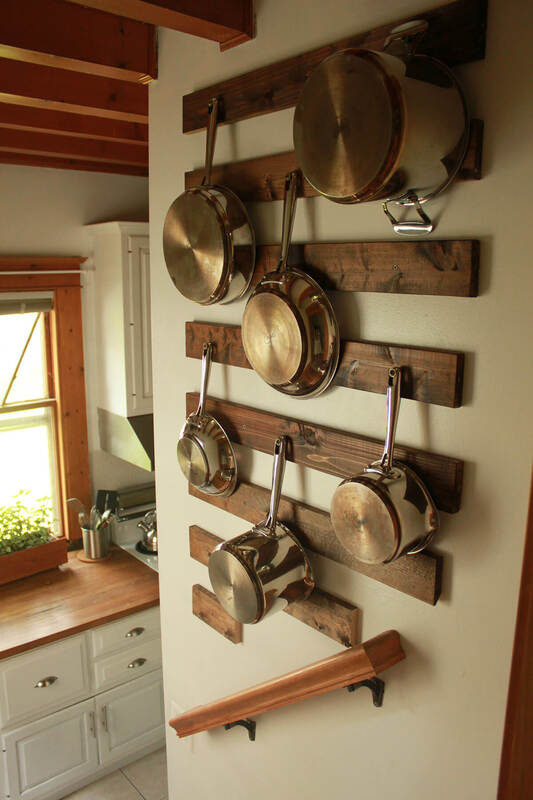 Keep reading to learn more about all 36 awesome kitchen wall decor ideas! Accent your dinning room entrance with a phrase we have all come to know and love. The utilization of old cutting boards brings reference to meal time: a feast to commence the end of another day. The treated wood lettering meshes with the tattered style of the boards. It brings out the “work” that goes into the preparation of a meal. Prepare for the meal-time blessing with this timeless canvas piece. Embrace the upcoming meal with a touch of phrasing that calls for reflection and brings out your inner compassions. 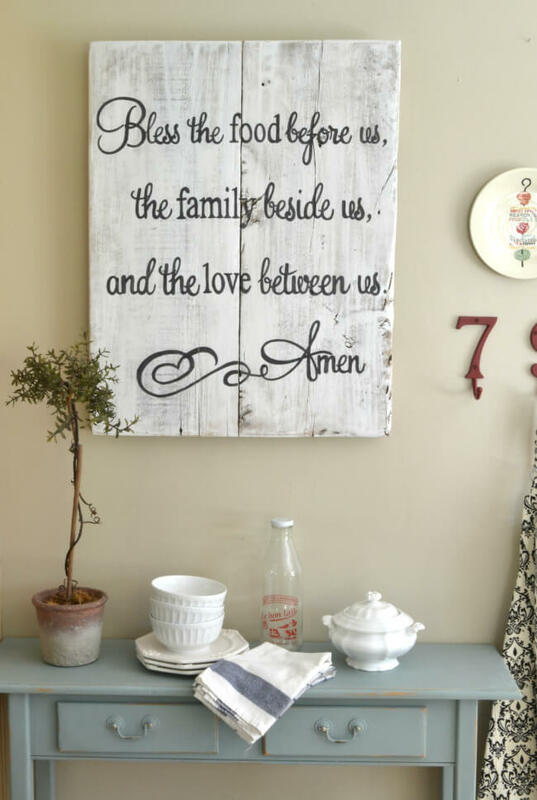 This timely piece can also be created with wood stylings, tailoring your dinning space to a place of blessing before meals. Introduce your kitchen workplace via a timeless metal piece. Back the lettering with painted corkboard or hardwood to give the letters the shine and appeal they deserve. 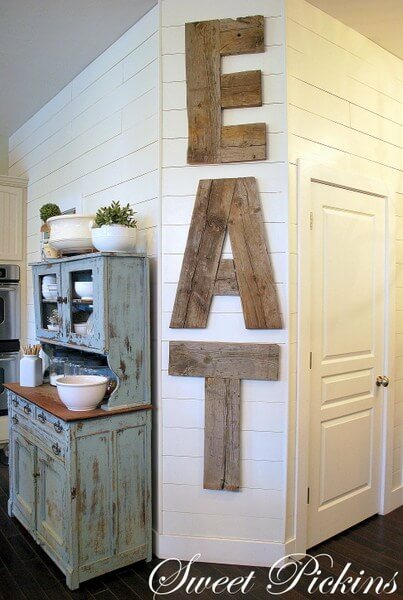 Adding a texture to the lettering gives the kitchen a rustic look. Polish to make this element shine above your workplace. Reveal the secret ingredients that have been passed on through generations through this excellent display. The framing brings precedence to these elements of cooking that have thrived on for centuries. 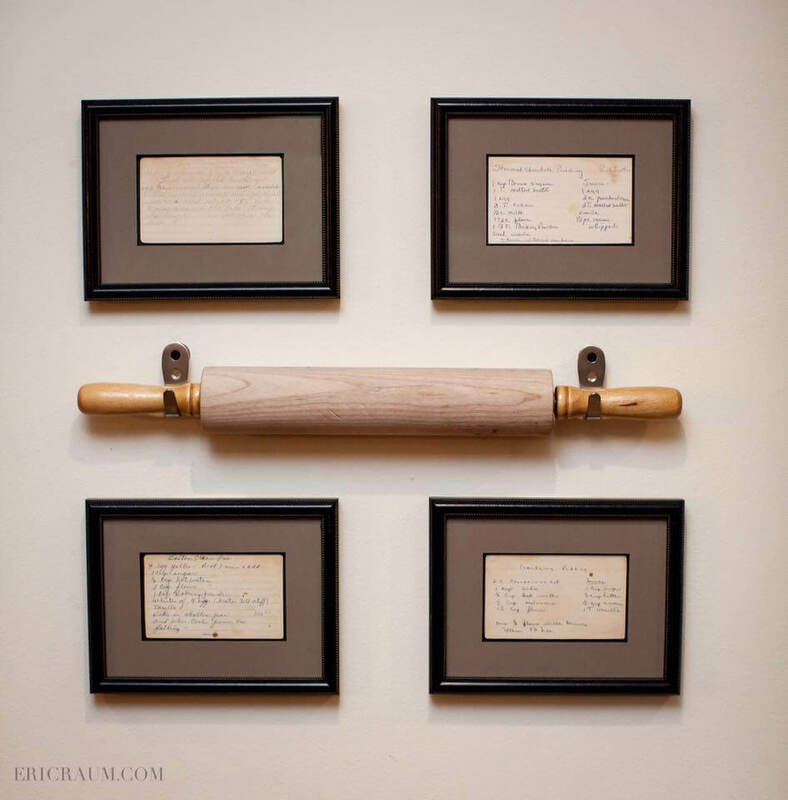 Adding the tattered rolling pin ties the piece to many instances of hard work and determination of perfecting a craft. 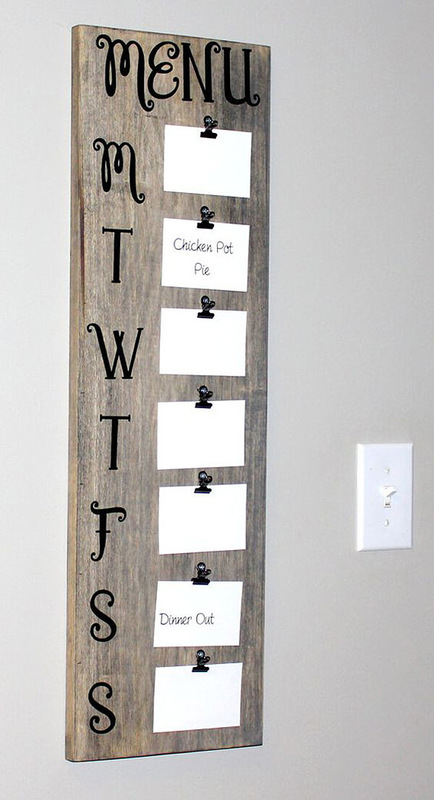 Set the weekly eating schedule via this hardwood creating. Add stylish lettering to make each day of the week stand out. Metal clips help create an ease of replacement and allow you to shift these options with ease. This piece helps bring out the importance of meal preparation and excites the individuals of the household as they anticipate their favorite dishes. Transform old and tattered shower rods or curtain rods into a preservation space for your herbs and spices. This transformation gives purpose to these older elements, bringing a livelihood of fresh ingredients and aromas into the kitchen. This piece also helps to lighten up your space and can infuse the airwaves will hints of what’s to come. Locker or bike baskets make for great wall hangers. These baskets keep fresh produce, fruits, and veggies free of contaminants. 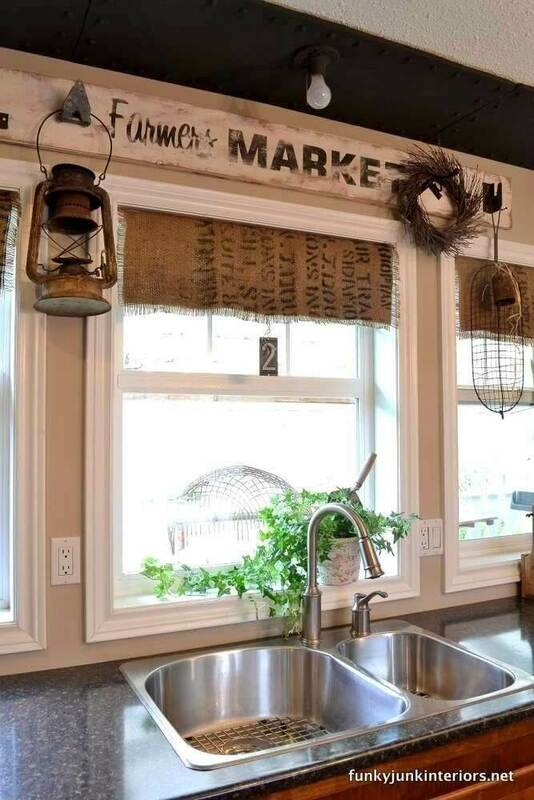 The sign helps open an internal marketplace that brings the farmer’s market to the comfort of the home. Fading the lettering on the sign gives the space a classical look that is sure to turn heads from young to old. 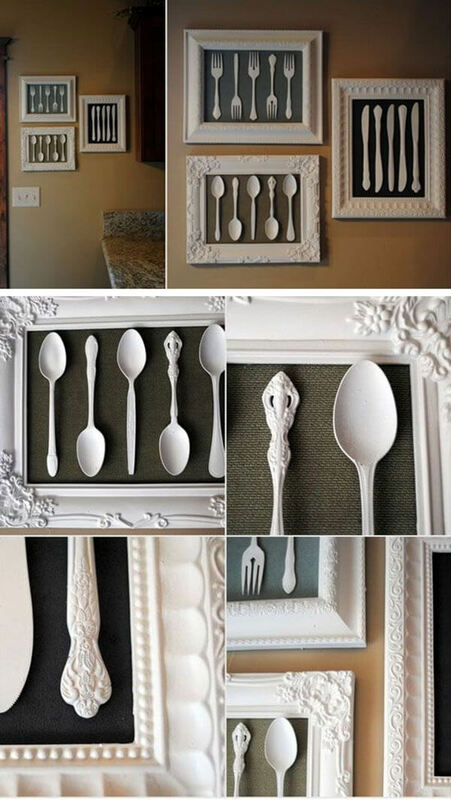 Matting your endeared silverware and utensils is a great way to show appreciation for meals. Border these pieces will color combinations that suit the tones of the utensils. The black background helps these elements pop off the surface, creating visual appeal from close-up and at a distance. Photography goes best with a stylish background. Treated hardwood that shows wear helps to make imagery pop. This creates an appeal to the visual appeal of fresh foods and colorful imagery. The clips provide an ever-changing canvas that can be updated on a seasonal or weekly basis. 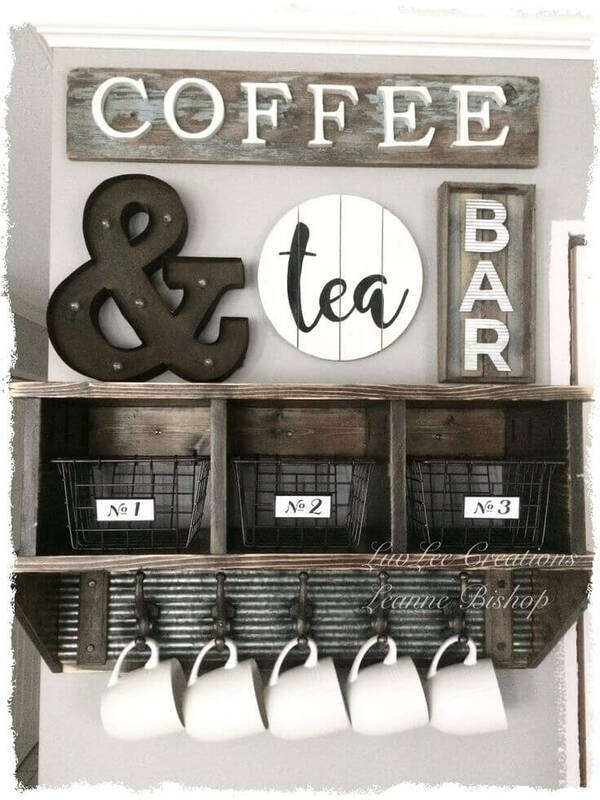 The function of a wall cabinet and coat rack combination can create for that morning greeting of a Cup of jo. Seed your ingredient inclusions will deep toned baskets. Faded wood or old metallic siding gives coffee that rustic nature it was born to host. Title your location with metal or wood lettering, treating with screws, rusted metals, or other working materials. 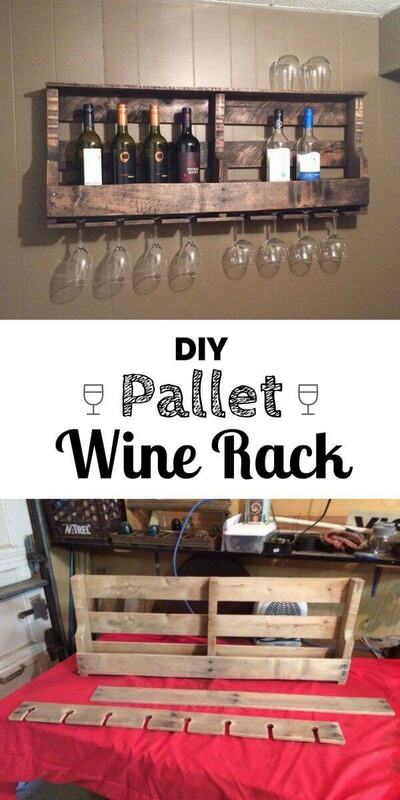 Pallets can double as a simplistic option for a homemade wine cellar. The rough wood can be treated with a coating to bring out the divots and grooves that the wood hosts. Spacing allows for easily removal, creating an ease of access to your beverage of choice. Just like good wine takes proper aging, so does the detailing of this classical piece. Old feed sacks make for a fitting element in the kitchen curtain space. The weavings of these materials help to create a strengthened shield against the rays of the sun, emitting shallow tones of light to brighten your kitchen space. They also bring a vintage look to any modern kitchen, helping you to mesh your layout with elements of new and old. Adhere to the tame offering of an antique wood clock to mesh to the modern advancements of the kitchen space. This rustic display introduces glimpses into the past and is brought to life via the inclusion of the plant holdings. Treat your entry walls to a timeless style that suits any color scheme. 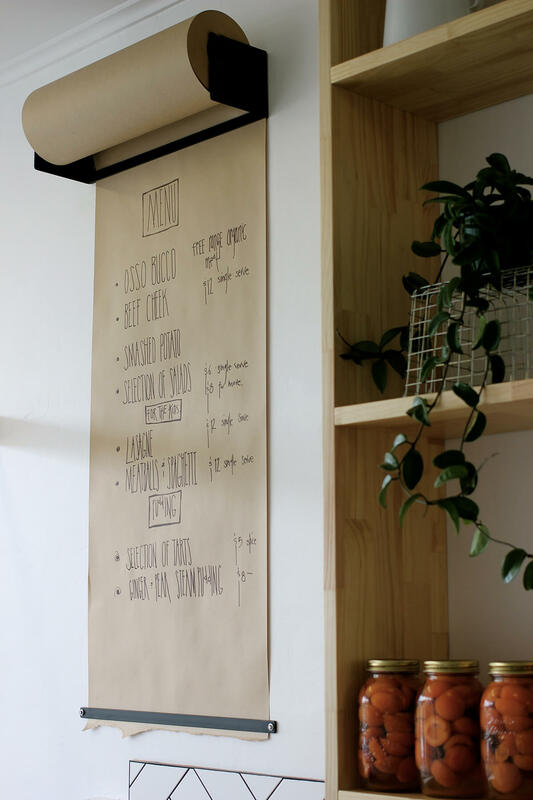 Roll out the nightly menu in style with this butcher paper menu. This endless option hosts simple replacement and keeps it simplistic for dinner guests. Drape down an entire wall to ensure you don’t miss any of the important inclusions in tonight’s dinner plans. Rod iron make for a great shaping tool. Spelling out the dinner call in a rustic manner keeps you guests in-the-know of the determination that went into the preparation. The styling of the lettering can also offer a high-end look for low-end pricing. 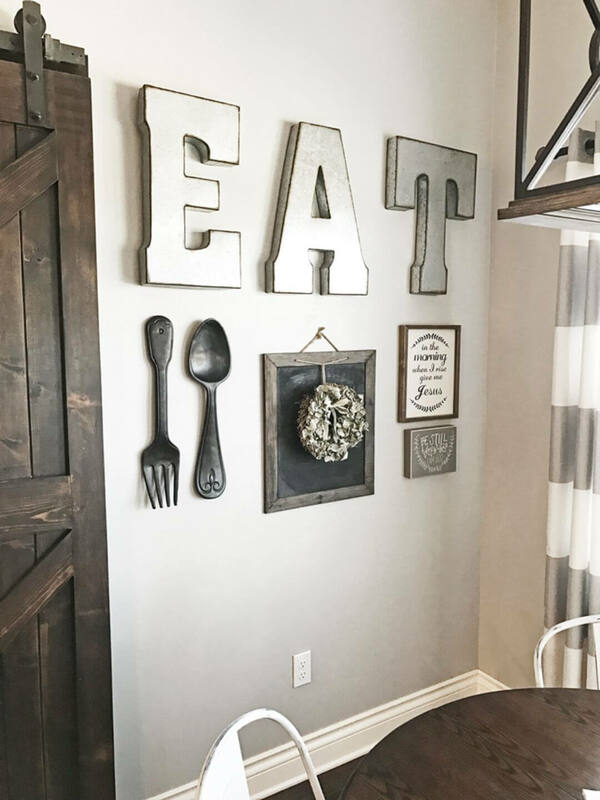 Transform your wall into a display and homage to meal-time with this preserved piece. Bring reverence to the act, the items used, and the people that made it possible. This combination piece helps call attention to all the important factors that go into meal preparation and removes the materialistic view on meal-time. 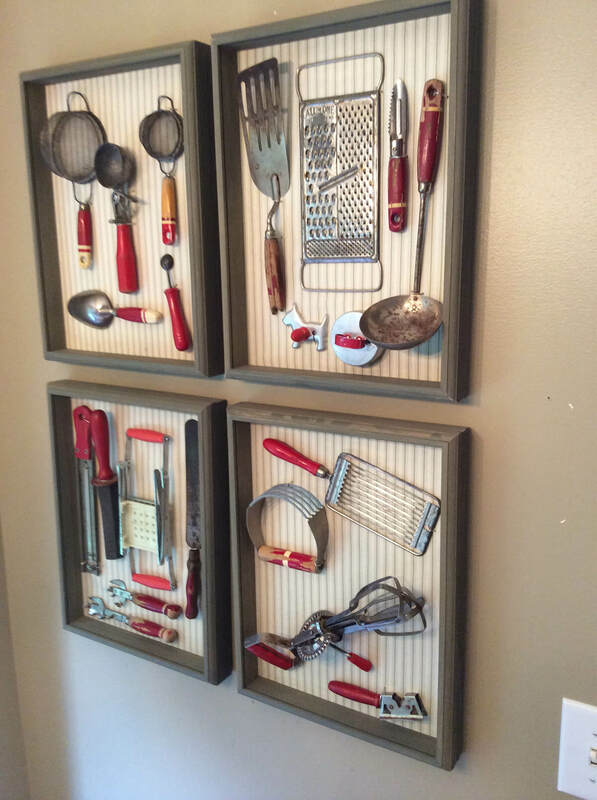 Shadow boxes are a great preservation piece for adding a 3D element to your kitchen. These boxes extend from the surface, allowing for a full view at all angles. Add plastic fruits and veggies to spruce up the flavor being offered in your kitchen. Removeable tops makes changes and additions an ease for the user. Using the “no bull” approach on your guests can be a useful tactic. Remind your visitors of the process and offer them the compliments of the chef in this subtle piece. Burned edges and additional paint can make your lettering pop and it calls attention to the phrase. Coat hooks and hardwood meet in this fashionable wine display. Simplicity is the name of the game with this piece. Reduced lettering keeps this piece as a straight-forward choice to your beverage options. 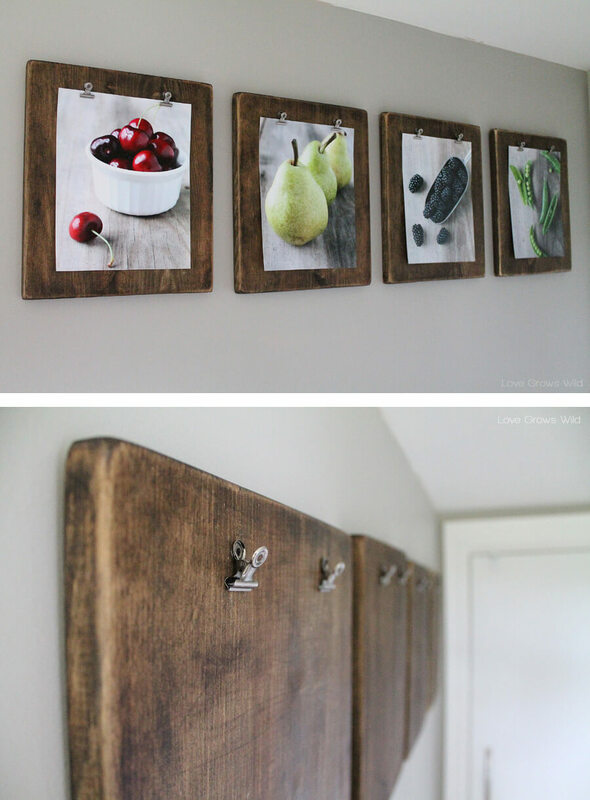 Cutting wood boards and cascading them upon your wall has never been so easy. Add a light treatment to the wood to bring out a deeper color or to showcase the grooves. Small nails help to hold the pots and the strategic nail placement can provide unique patterning designs. 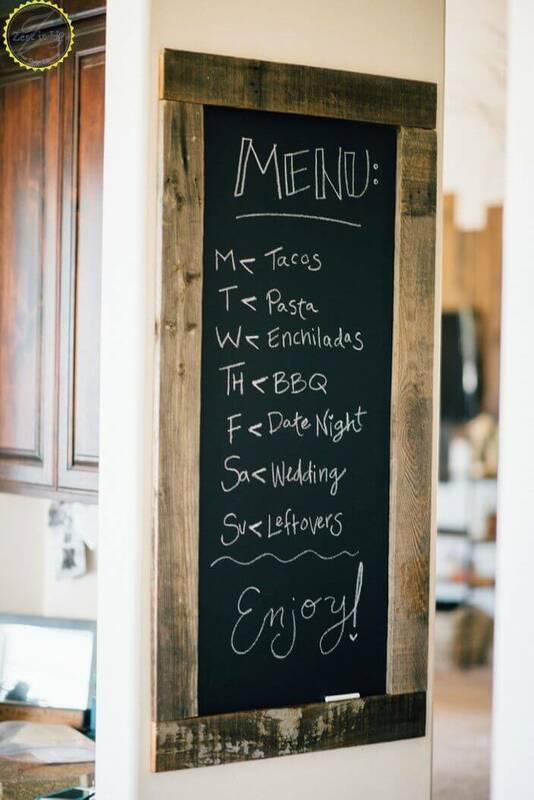 Keep your workplace a productive place with the ever-changing chalkboard menu. Display the daily special with a little extra attention to detail. Offer weekly advances into what’s cooking in the kitchen. This hardwood border calls attention to the white-on-black wording, keeping it visually appealing for your guests. 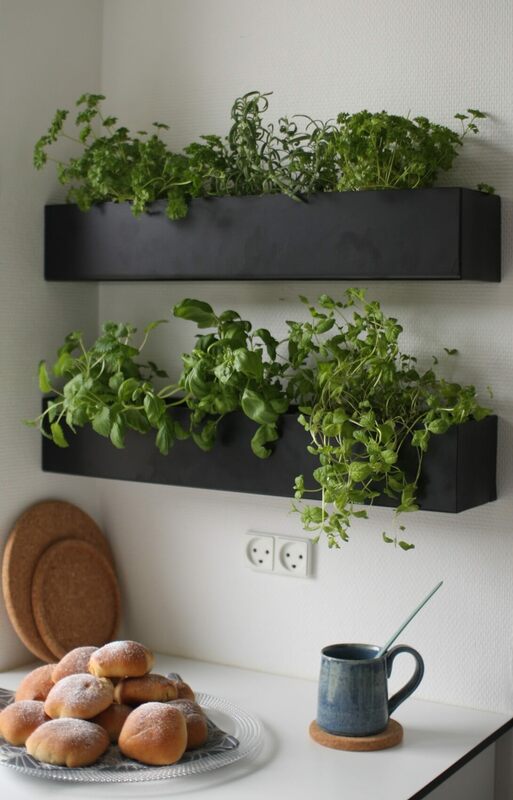 Square boxes can also be fastened to the wall to hoist plants and herbs. A small botanical garden greets your kitchen with a lively element that infuses colors and aromas into the air. Water simply and grow herbs to include in your secret recipes. 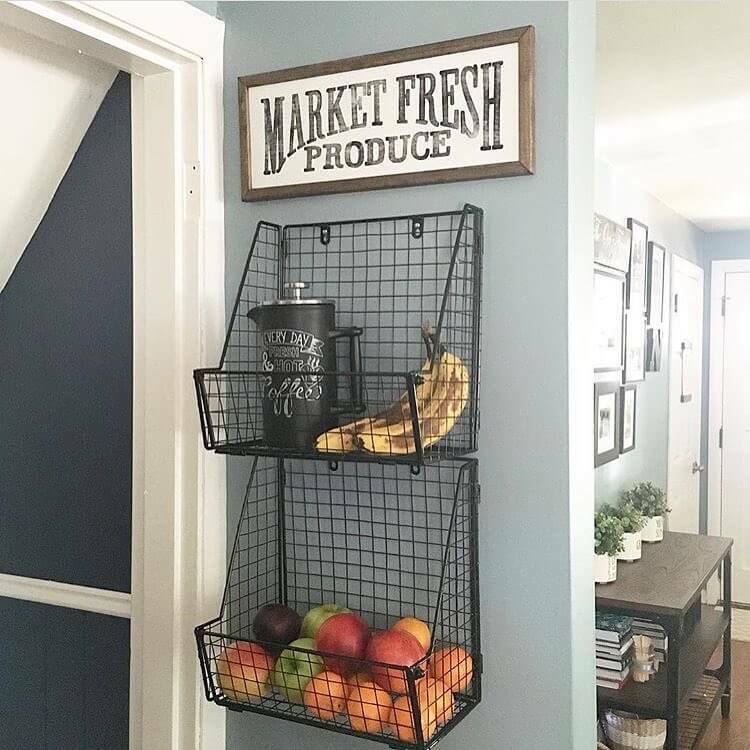 Chicken wire baskets offer a fresh market of goods to your kitchen. It brings an on-the-go element for keeping users refreshed through achievement of daily vitamin levels. Dark wood treatment gives it that farmer’s market feel. These contrasts also help the vibrant colors of fruits and vegetables pop-out from this display. 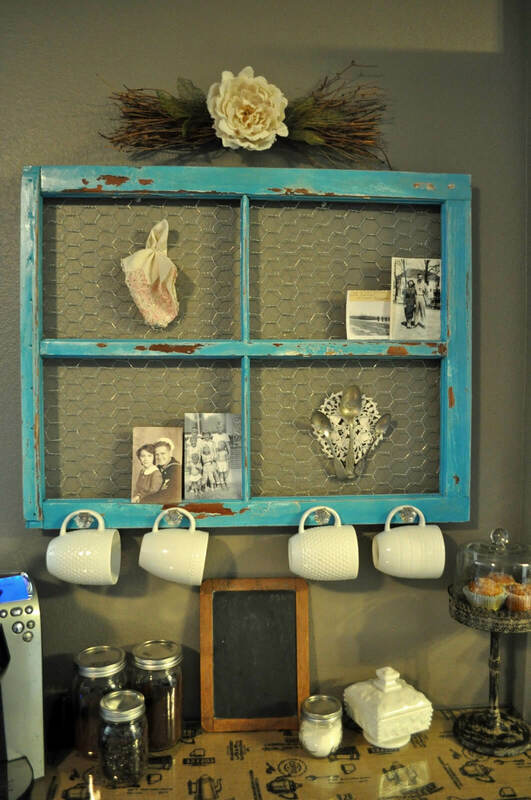 A wood border with a chicken wire background creates for an ever-changing canvas of elements of the past and present. Display your favorite photographs, kitchen antiques, or other such trinkets. The hooks are added to keep your mugs hanging flush and angled to the proper degree. 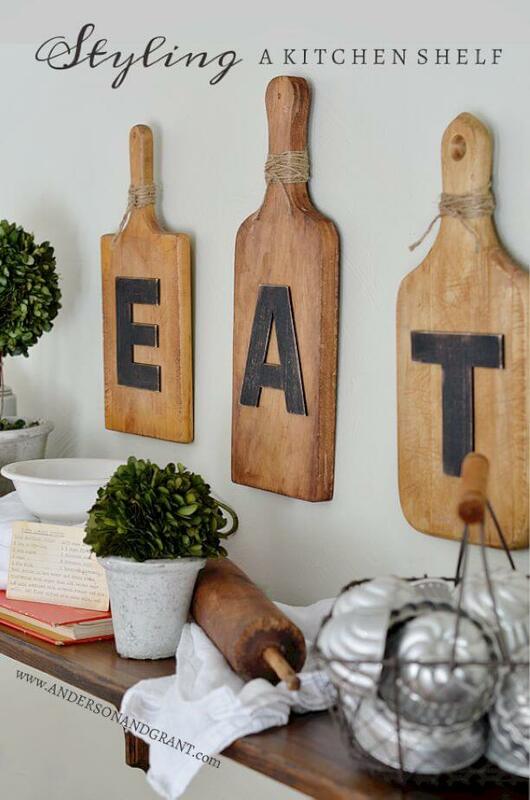 Large letter displays are also good for a kitchen attention getter. This large display features older hardwood that has been roughed up in the past. It offers a glimpse into the past while catering to the natural setting of a modern kitchen space. Shelving via plank boards is also a simple improvement that will set nicely in any kitchen. Wall shelving brackets provide a sturdy hold to this hefty hardwood. Option for larger brackets to host a larger shelf space. This multi-purpose shelving unit makes for a solid hold for any kitchen elements. Take a differing approach to the modern coat rack through the creation of your own apron holders and shelving unit. 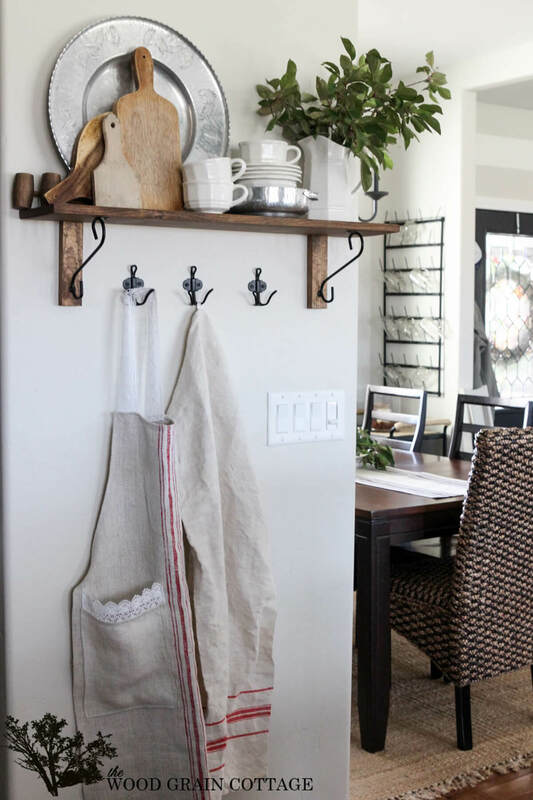 The separation of materials creates for a visual appeal and reduces the cluttered look coat hooks often possess. Widening the spacing helps draw attention to the crafts that whip up the magic that happens in the kitchen. 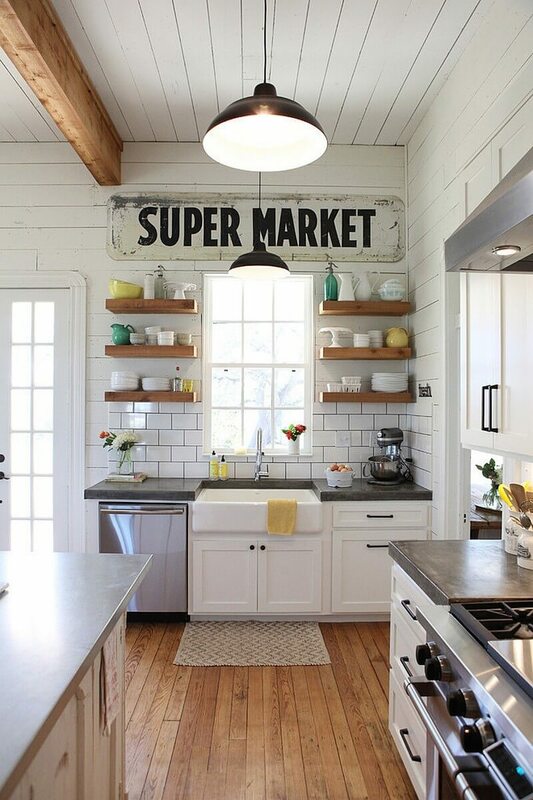 An old metal sign makes for a great blank canvas of use. 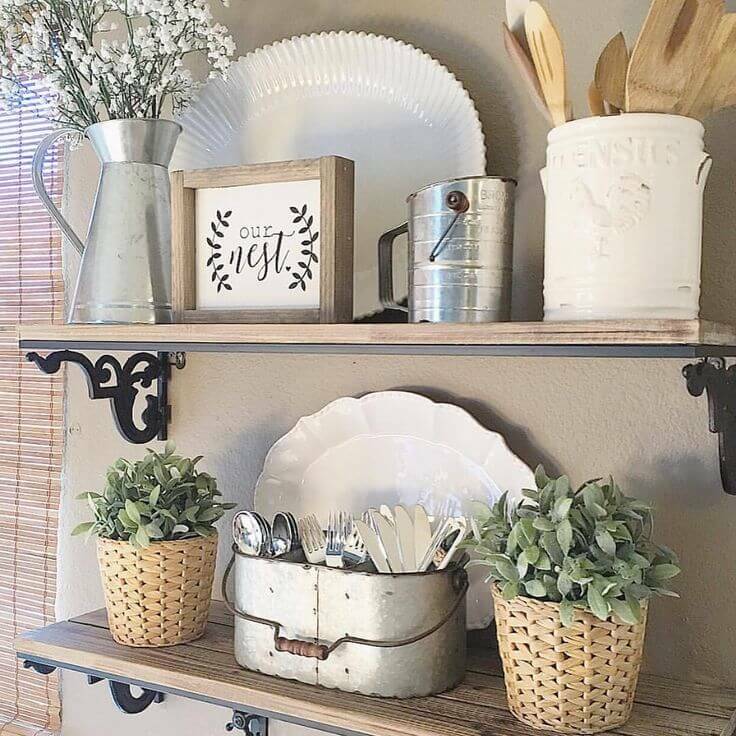 Apply a thin paint to keep the rustic look of the metal shinning through in the background. 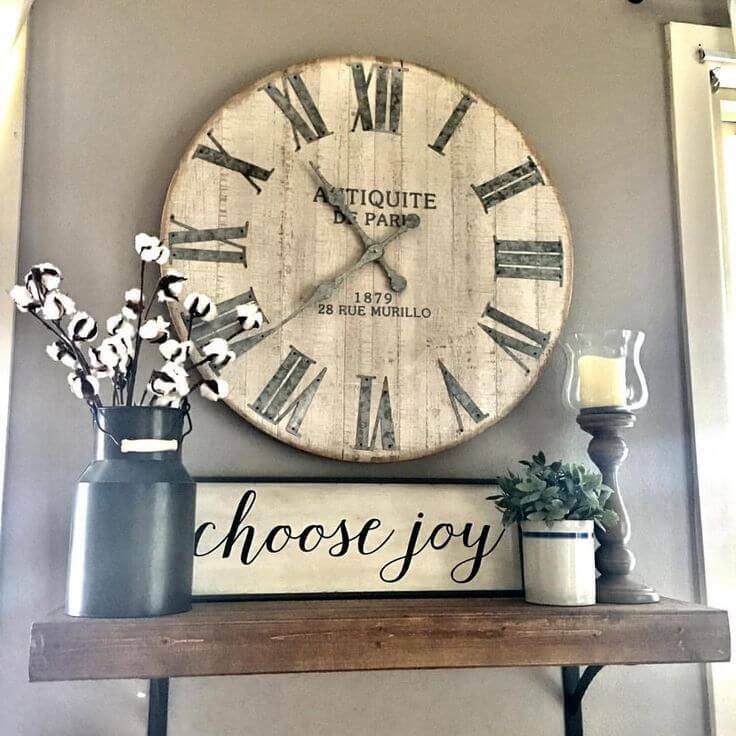 Utilize stickered lettering to start the display, followed by small cuts and paint blotches to give it that throwback feel. This signage adds touches of classical appeal to any kitchen platform. 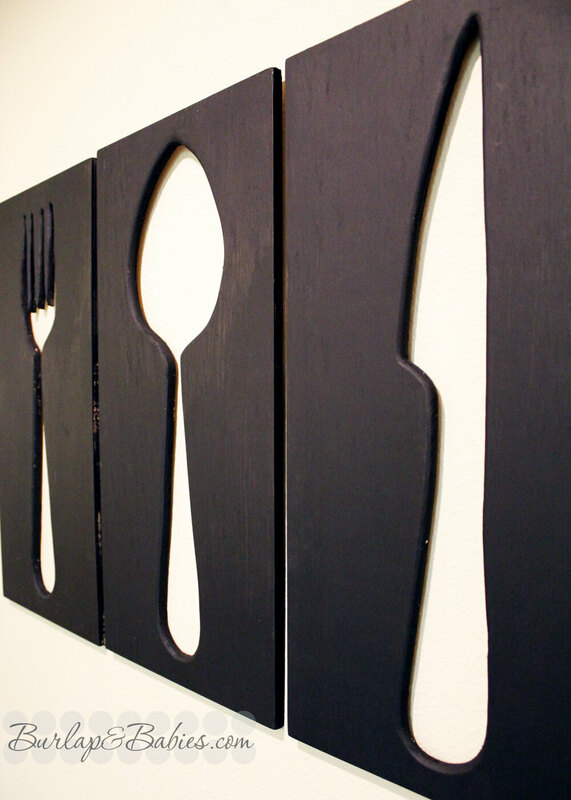 Creative wood cutting can also find its proper space in the kitchen through these frame-like, shadowing masterpieces. Shaping the utensils helps shape the force of achievement the utensils provide users with each and every meal. Patterned steel brackets also make for great shelving hosts. The design of the steel brings importance to both the holding of the shelf and the elements that it is to host. Using a two-color scheme helps make this piece pop on the wall. To add elegance at a small price, utilize this arched chalkboard display. This menu helps call attention to important meal inclusions and keeps guests in anticipation of the offerings to come from the kitchen. 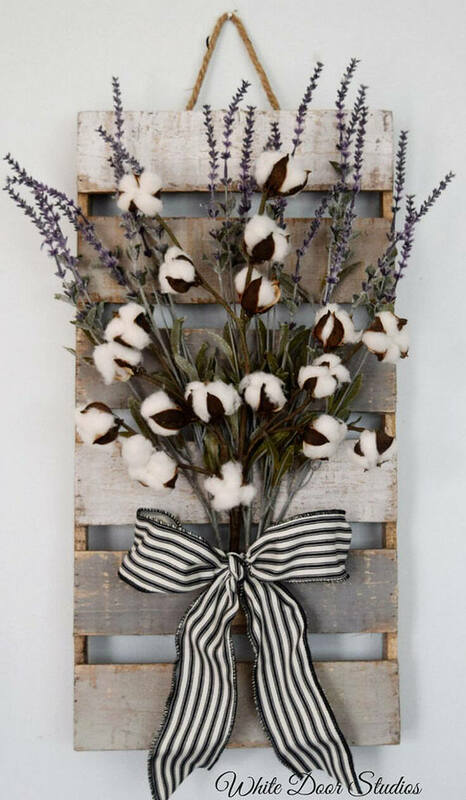 Combine cut pallets with flowering displays to give your kitchen a theme of elegance. The backdrop provides the work component, while the display meshes with this element to create peace and serenity. This classical option makes for an optimal fit in any kitchen. Creating columned wall art is also a fashion that fits the smaller width areas. Cascading the letters in descending order draws attention to the entire space. This helps tie up areas of your kitchen that lack coverage and can fit into tight spaces. Museum-like open frames make for great placement holders for the tools of your trade. These 3D creations help to combine elements into the proper setting, with compliments and counters to your key kitchen contributors. This is a nice touch for those looking to make their gadgetry stand out amongst the larger appliances. Cutting 2 by 4’s into halves creates for a strong backing. Layer these pieces side-by-side to produce a background that can alter the color configurations. 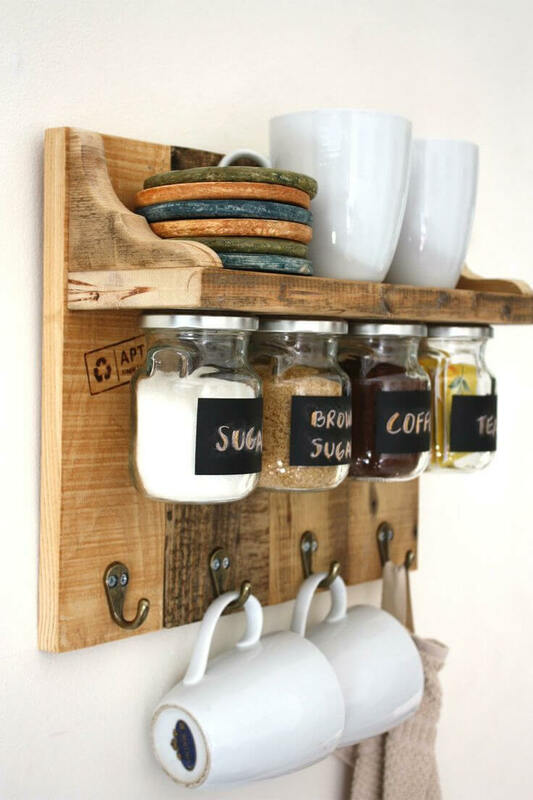 Add hooks and a small shelf to produce a mini coffee bar. The contrast in wood types can create for a treated look without having to apply additional coatings or sealants.